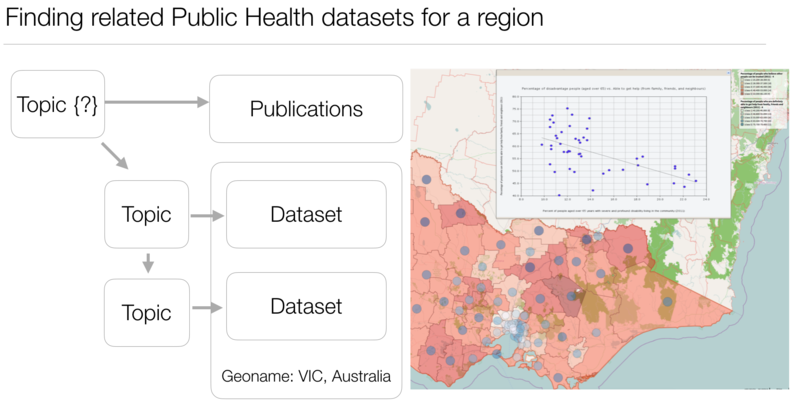 In this working group, we aim to build a graph of different public health aspects and use this model to link public health data to research activities, research investments and research infrastructures. For a researcher who works on chronic disease, he/she needs to spend a considerable effort in finding data related to other conceivable factors such as the overall well-being of patients, financial hardships, access to health services, physical activities, alcohol consumptions, and other social factors that can affect the community. The problem is finding datasets from all of the other disciplines; furthermore, once our researcher finds a related dataset, it is difficult to identify an expert who can assist with using the data. Such complexities make public health research expensive and inefficient. This working group aims to assist researchers to find better data and identify domain experts in public health. Furthermore, our work would enable policymakers and practitioners to gain a better understanding of the landscape of public health research.